St George's has long figured in fact and fiction as a centre for fashionable weddings, and was referred to by a Victorian writer as "the London Temple of Hymen". The first entry in the Marriage Register is dated April 30th, 1725. In that year there were only thirty weddings, but from then onwards the numbers increased steadily till the beginning of the 19th century when they reached four figures. 1816 was a record year with 1063 weddings, including nine on Christmas Day. A most remarkable wedding was that Prince Augutus Frederick, Duke of Sussex, 6th son of George III, to Lady Augusta Murray, daughter of the Earl of Dunmore. They were secretly wed in Rome on April 5th, 1793. 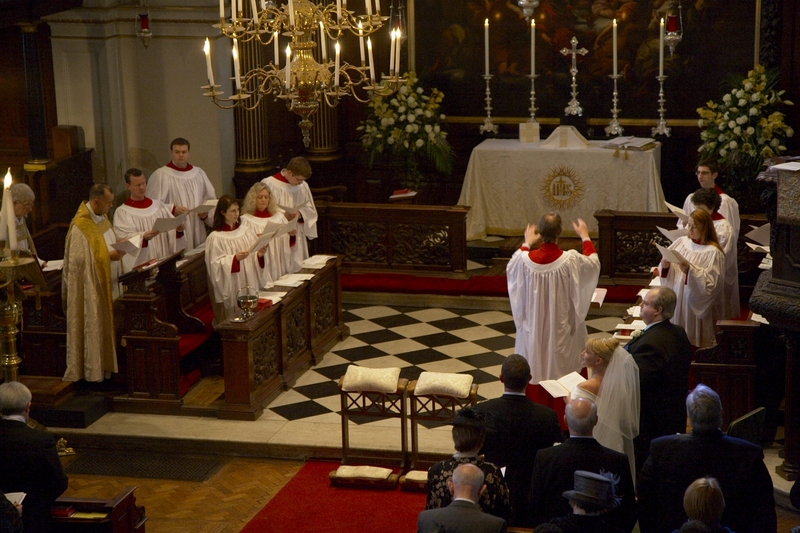 On their return to England, they were again married in St. George's on December 5th. The King's consent had not been obtained, as required by the Royal Marriages Act, and the marriage was annulled in the summer of 1794! The Prince and Lady Augusta lived happily together until 1801, and produced two children. When Lady Augusta died in 1830, the Prince felt free to marry again. His second bride was Lady Cecilia Buggin, widow of a former Lord Mayor of London, whose first marriage had taken place in St. George's in 1815. Queen Victoria recognised Lady Cecilia as the Prince's wife, created her Duchess of Inverness, and received her at Court. Another marriage with Royal connections took place on October 18th, 1819, when George Augustus Frederick Fitzclarence, eldest son of the Duke of Clarence ( later King William IV), by the actress Mrs. Jordan, was married to Mary Wyndham Fox. Bigamy figured in the marriage of the Duke of Kingston to Elizabeth Chudleigh in 1769. She was already secretly married to Augustus John Hervey, later 3rd Earl of Bristol. Tried for bigamy by the Peers in 1776, she was found guilty and retired to the Continent. A somewhat more exotic bride was the adventuress Lola Montez (Marie Dolores Eliza Rosanna Gilbert). After a successful stage career, she became the mistress of Ludwig I of Bavaria, who created her Comtesse de Landsfeld. Her undue influence over the government of Bavaria led to her banishment in 1848. On her return to England, she married George Trafor Heald, a wealthy young Guards officer, in St. George's in 1849, although she already had a husband living. They fled to Spain to avoid bigamy proceedings. She returned to the stage, touring America and Australia, where in 1856, she horsewhipped the editor of the "Ballarat Times". She devoted her closing years in America to helping fallen women. The marriage of Joseph Grimaldi, the celebrated actor and clown, in 1798 did not last long; his young wife Maria Hughes died within the year, and Grimaldi married again in 1802. From the world of letters we find the marriage of the poet Shelley to Harriet Westbrook on March 24th 1814; the novelist and poet George Meredith to Mary Ellen Nicholls, widowed daughter of Thomas Love Peacock in 1849; the novelist George Eliot (Mary Anne Evans Lewes) to John Walter Cross in 1880; Oscar Wilde's lover Lord Alfred Douglas to Olive Eleanor Custance in 1902; and John Buchan to Susan Charlotte Grosvenor in 1907. Two famous politicians should be noted. Benjamin Disraeli married Mary Anne, widow of his friend Wyndham Lewis on August 28th 1839. She was ten years his senior. Her affection and wealth gave him much-needed security in the early stages of his political career. In 1886, on December 2nd, Theodore ("Teddy") Roosevelt, the future President of the United States of America, was married to Edith Carow. He was a widower, and described himself as a "Ranchman". He qualified for marriage at St. George's by staying for the required period at Brown's Hotel in Dover Street. The marriage entry of Herbert Henry Asquith to Margot Tennant is unique in bearing the signatures of four statesman, who were at some period Prime Ministers of England - Lord Rosebery, A. J. Balfour, W.E Gladstone, and Asquith himself. Also to be found is the name of Guglielmo Marconi, the Italian inventor of wireless telegraphy, who married Beatrice O'Brien, daughter of Lord Inchiquin, on March 16th, 1905. Finally, Conan Doyle used St. George's as the venue for a marriage ceremony. See "The Adventures of Sherlock Holmes" and the chapter headed "The Adventure of the Noble Bachelor". Eliza father Alfred Doolittle, of George Bernard Shaw's Pygmalion fame was also married in St. George's, (where he was “getting married in the morning” in the My Fair Lady adaptation of the book), but neither of these dates appear in the register! !